Not Tomato-lets Any More, originally uploaded by arahbahn. 4 years ago I sure wasn’t interested in growing any vegetables, much less tomatoes, much less on my back porch. Lately, the three characters pictured above are making my day, every day. Life is strange. It’s summer! The garden’s insatiable need for weeding gives me another reason to spend time outside. Yay! Last year I discovered that growing vegetables is fun! The metamorphosis is fascinating, and you don’t really eat Cosmos or Cleome, pretty as they are. We’re in a recession. It saves money. Or, it could, if we grew a few more things. Theoretically. Heck, I get to show off photos, that’s something. Stuff I grow tastes better than that mealy dreck the supermarkets sell. It can taste as good as what growers at the St. Paul Farmer’s Market sell. I’m presently experimenting with a nutrition program which advises athletes to consume 50% of their calories from vegetables, 25% from whole grain, and 25% from meat protein. It’s a challenge – I’m looking to more tubers and legumes, than I used to! This doesn’t impact my garden much, as I didn’t start the program early enough to get any of those into the earth, but I’m learning a lot about what I could grow, from the nearby co-ops (Mississippi Market just opened a new, bigger store, closer to my workplace!) and the farmer’s market. Glad you caught the vegetable growing bug! It’s pretty rewarding, isn’t it? 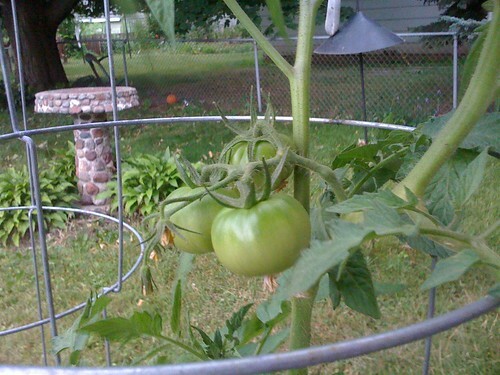 And nothing smells better than a tomato plant, in my opinion.